Predictably, the MI6 ran & NATO funded warmongering propaganda operation "Integrity Initiative" blames the anonymous hack of their servers on "Muh Russia." Link to the article posted by @Avery1776 attempts to make the case that the GRU hacked Integrity Initiative and leaked their findings. The Institute of Statecraft is the HQ for Integrity Initiative. The co-founder has no proof it was Russia but claims specifically the GRU was behind the hack. In fact he claims, "it's the only thing that makes sense." Keep in mind this is a NATO funded MI6 ran operation using members of MSM to propagate flat out lies & disinfo. It has to be Russia...couldn't be anti-war Anonymous hacking groups who are fed-up with #FakeNews & war? This is a "mocking bird" like project which operates globally focused on making Russia the "big bad wolf" so we all dump more money into military & intelligence budgets. Which makes it hilarious when the author outs himself as being part of the Integrity Initiative. This is only one of many similar anti-Russia disinfo "Counter-Propaganda" operations we've seen. Take a look into this to see how many of these projects are directly linked through similar names, funding, and agendas. Keep in mind in the UK things are very intense regarding Brexit & the EU. One of the biggest names involved with Integrity Initiative (in my opinion) is Sir Richard Dearlove. His primary interests include maintaining his intelligence back-channels & contracts post Brexit. Sir Richard has his dirty hands on so much around #SpyGate. So he's a primary contributor to the Russian Hysteria which they've successfully created in both the US & UK. These aren't coincidences. Look into him yourself. Check out this article from @CraigMurrayOrg. I've mentioned the importance of Pablo Miller (Orbis/MI6) many times. Now it appears this is much more broad. Skripal & Syria "poisoning" linked. Pablo worked for Chris Steele's Orbis while Steele was chasing after Russian boogymen for the UK & the DNC. Keep in mind, Pablo's job was recruiting & handling Russian double agents who normally ended up poisoned. One of the reasons I've stuck with this is the #Spygate angle. The other reason is the media outlets are focused on the UK side making it *sound* like it's only liberals being attacked. That's clearly not the case. They're attacking anyone who stands in the way of war. It's often difficult to navigate these #Propaganda projects. For example, the UK media has accused the Legatum Institute & it's founder of being tied to Russian Intelligence. Legatum is said to have significantly impacted #Brexit. Except when you look into Legatum it becomes extremely unlikely they would be working for the Russians. They're just staying ahead of the financial impact of Brexit so they can profit..like Dearlove it's about profiting from war & destabilization. Legatum is another CIA connected propaganda pushing network of warmongering Neoliberal/Neoconservative Atlanticists who now align themselves with people like Pierre Omidyar and Bill Kristol. They publish papers with CEPA like this one below. Legatum recognized contributors included one of the other Integrity Initiative journalists outed in the above mentioned leak. Ben Nimmo is a senior fellow at the Atlantic Council and rabid Russian bot hype man. The "Digital Forensics Research Lab" and NATO press office. He's not even hiding it.. They recommended, among other questionable tactics, the "monitoring of social media, identifying trends and personalities that are popular among polarized social groups and who could be engaged to build trust." "Facebook technology is already used to try to deradicalize far-right extremists and jihadists. Similar initiatives should be undertaken with those who have fallen victim to Kremlin propaganda." Knowing Legatum is funding and partnering with CEPA to fight Russian disinfo why would the UK MSM attack them for being Russian influenced? If true, it'd be those like Mr. Skripal who work for MI6. Then there's the whole Bill Browder HSBC angle. Just in case you need more "names" linked to this network, here is the CEPA advisory board. Look closely and recall the above mentioned propaganda, warmongering, and #SpyGate connections. Furthermore, if you followed the links above regarding Browder than you likely already connected the dots. If not, I'll make it a little easier. Browder is part of the Integrity Initiative. He & Chandler have been associates for years. I'm no expert on the Browder case but his involvement with Legatum & Integrity Initiative is significant to consider due to Browder being linked to the Trump Tower meeting. Now please scroll back up to the CEPA advisory list above. 2nd pic lists "David Kramer." Nov '16 No-name sent Kramer to a London meetin with Orbis to coordinate the leak strategy with Buzzfeed. McCain had already met with Andrew Wood at Halifax to discuss the Steele Dossier. Wood vouched for the dossier's authenticity was also working for Orbis (Steele) who was being paid by Fusion GPS (DNC). This is one reason so many of us are pissed at No-Name. He was a primary contributor to #RussiaGate & ultimately the Mueller #WitchHunt. Sir Andrew Wood himself is listed as an Expert contributor to the Integrity Initiative! He is a key member along with Browder, Nimmo, Lucas, Applebaum and others. These are not coincidences. Of course, I don't have the SIGINT to prove conclusively these people were part of a "conspiracy" to meddle in our election but it's definitely the frame work for the @NSA & @TheJusticeDept should consider. Wood immediately vouched for his partner and the validity of the dossier through BBC broadcasts. He told fellow British spook Luke Harding he took the dirty dossier seriously. Recall that Steele met with both Wood & Dearlove at the Garrick club to discuss the dossier. After Wood meets No-Name, Kramer goes to Steele and passes the dossier to Comey & Obama. No-name's plan was to force Trump to resign. Orbis: Chris Steele, Pablo Miller, Andrew Wood, Richard Dearlove, Halper. Integrity Initiative: Browder, Wood, Miller, Dearlove, Nimmo, Applbaum. Legatum & CEPA: Browder, Kramer, Lucas, Nimmo, Applbaum, Albright, Ilves, Bildt, and more. Reminder that both @GenFlynn & @carterwpage who are both Military Intelligence officers attended Dearlove & Halper's Cambridge Intelligence Seminars in 2014. Halper & Dearlove left the seminars after claims of influence by Russian Intel fronts in 2016. Not only that but they are all in attendance at the same Cambridge University Conference discussing counter intelligence in July 2016 just three weeks before the FBI launched "Crossfire Hurricane." 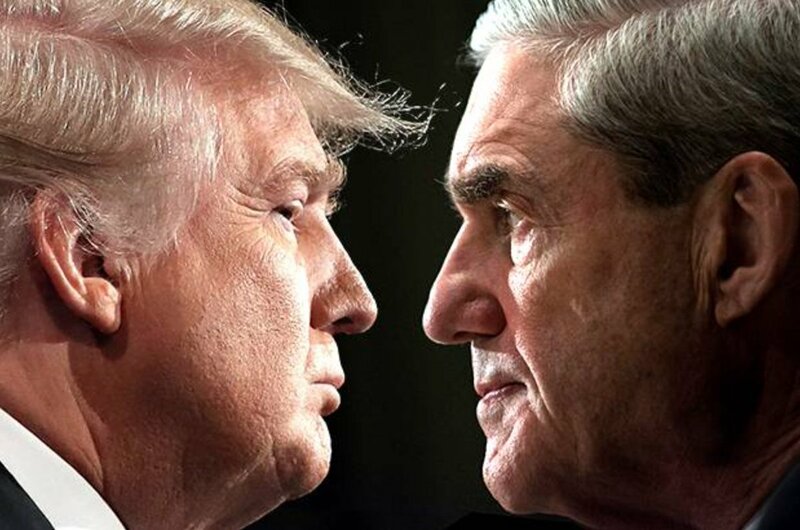 Additional threads to review that directly link to the #SpyGate & #RussiaGate episode. CS was created by Warburg Pincus, McAfee and "former" FBI agents. Joseph Landy is the Co-CEO of Warburg and on the board at Crowdstrike. He also shares a board with Sir Richard Dearlove at Kosmos Energy. Forgot to link the CEPA page but it's important. One of the CEPA advisors is Brian Hook. I didn't know he worked for Beacon Global. Hook is a Never Trumper who now works for Beacon Global. Looks like Kansas put him in a specific role to create distance btwn him but kept him around to help with the transition. His working for Beacon Global is a huge red flag. Well I was just hit over the head by this thread. Basically US/EU Globalists, CIA/State & MI6/FSO forced regime change in Ukraine. They planned on EU/NATO incorporation under HRC while the Russian military was still actively engaged. The main hub for these propaganda operations is the Atlantic Council. At a recent Ukraine House Davos meeting (Sponsored by Viktor Pinchuck) they discussed how important Ukraine is to the future of Europe. Read this for more insight. Here we have the UK pol Damon Wilson telling us that Trump can't really pull us out of NATO because he'd face a revolt from the Senate. David Brock is still triggered over HIS loss in 2016. Step back from the ledge David. How many millions of dollars have been spent on these smear campaigns? Has the opposition research into Trump topped a billion dollars yet? Four years straight of multiple "initiatives" launched by privately funded organizations & govt funded investigations to "Get Trump." I just have to share this thread again because it triggered so many ShareBlue shills. I'm still getting random trolls jumping in to let me know how bad the thread is. David Brock's "Correct The Record" attorney was Marc Elias at Perkins Coie. Perkins Coie paid for Crowdstrike's Russian Hoax Hack to cover up the DNC leak by the murdered Seth Rich & hired Fusion GPS to create the Dirty Dossier. There's been a bit of tempest in a teapot lately re the #IntegrityInitiative, following the release of leaked documents. 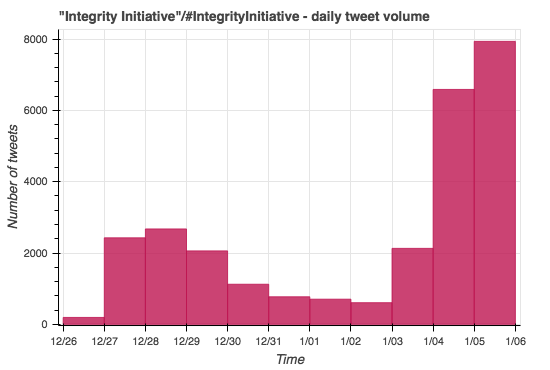 We downloaded tweets containing "Integrity Initiative"/#IntegrityInitiative, yielding 27213 tweets from 9054 accounts in the last 10 days. 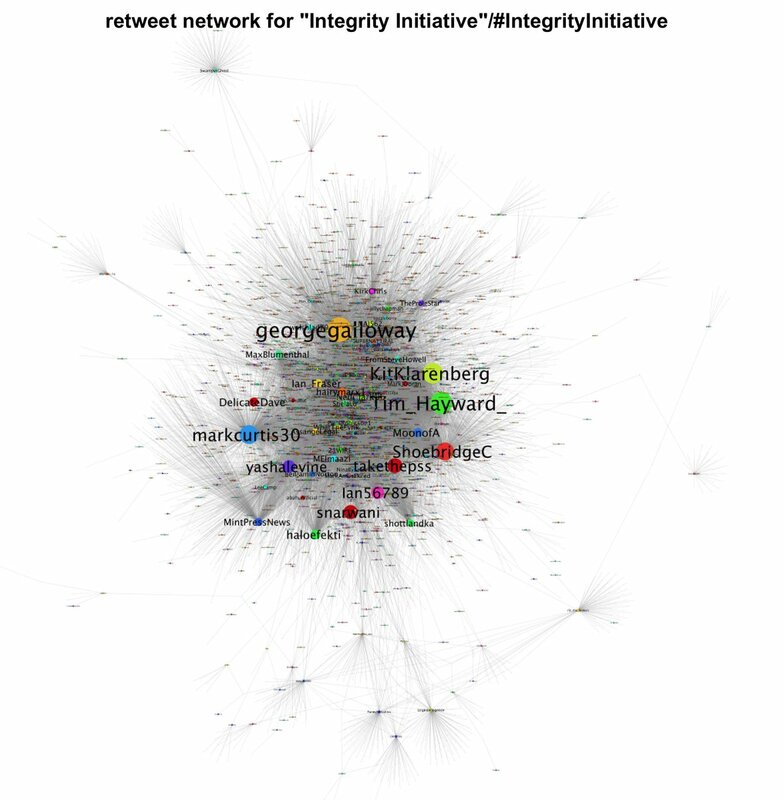 Retweet network for "Integrity Initiative"/#IntegrityInitiative. Several of the prominent accounts (@georgegalloway, @Ian56789, @ShoebridgeC) have a history of pushing #FalseFlag theories about the #Skripal poisoning. Sputnik reporter @KitKlarenberg also puts in an appearance. 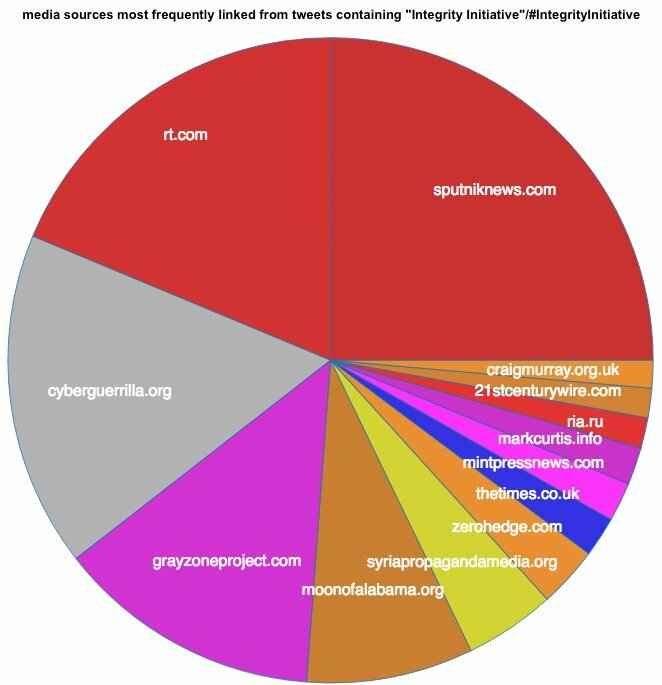 Speaking of Sputnik, here are the media sources most frequently linked from tweets containing "Integrity Initiative"/#IntegrityInitiative. Sputnik and RT comprise 45% of the volume, with the majority of the rest being comprised of Western conspiracy-oriented sites. #Anonymous has published documents which it claims have unearthed a massive UK-led psyop to create a "large-scale information secret service" in Europe – all under the guise of countering "Russian propaganda." Clandestine UK Operation “Integrity Initiative”,- a "large-scale information #secretservice" with the purpise to "counteract Russian propaganda" and allowing the #UK to meddle in other states’ domestic affairs. Meddling playbook: #UK runs covert network to 'counter #Russia'.